Some people will have already noticed that my primary website was dead for a few days, due to general-purpose bastardry by my web host. It’s unfortunate that I don’t have the option of simply dumping them forever, but the forum that’s used by a great many people is a valuable resource and it would be almost impossible to move it. With any luck, everything will be back to normal in a few days. Recently, I actually purchased a ‘power saver’, called “Electricity Saving Box”. I didn’t buy it to save power, but to run some tests and verify that it does not save power at all. In fact (and as expected), it uses power. 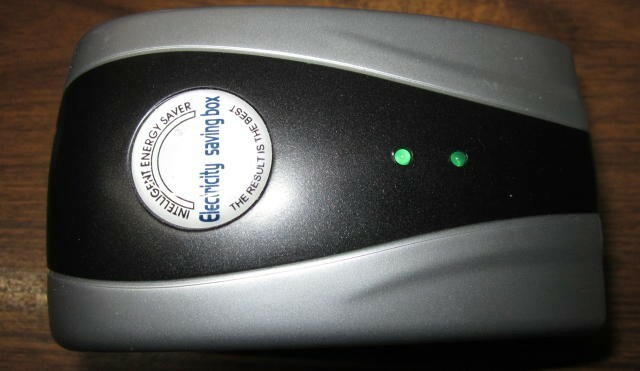 Not much (less than 0.5W), and the power it uses is for one task only – to light a pair of green LEDs that supposedly “indicate that it is saving power”. The above is a photo of the ‘power saver’, and unfortunately it’s just a complete waste of perfectly good plastic and electronic parts. The photo below shows what’s inside. There’s not very much, and what’s there doesn’t do anything useful. The large black object on the left is a capacitor, and these are the ‘heart’ of all ‘power saver’ scams. In this case, the capacitor is 5.1μF and while it can (partially) correct the power factor of small motors (and thus reduce the current), it doesn’t reduce the power, and this is what householders pay for. This is how these scams work. By showing the consumer that the current drawn by a motor is reduced, it is stated that this affects the power as well. No, it doesn’t. Power is the measurement of physical work being performed, and most motors draw more current than they need because that’s the way they work with light loads. Rather than repeat the whole article here, I suggest that anyone interested should read the full article on ‘power savers’ at The Great ‘Power Saver’ Fraud. Also see the test results at Test Results – ‘Power Saver’ Fraud. NOTE: The unit I purchased was very cheap, but some are considerably more expensive. Despite the extra cost, you still get the same completely worthless box that won’t save you a cent. Yes, you can find countless ‘testimonials’ from alleged customers, but I fully expect the vast majority to have been made up by the fraudsters who sell these worthless devices. Several years have passed since the original post, and our ‘new’ PM (Malcolm Turnbull) has done just as much as his predecessors – i.e. nothing at all. Lots of words, but no meaningful action. Australia exports LNG (liquefied natural gas), and people in Japan can (apparently) buy it cheaper there than we can here. This really does qualify as insanity, especially since we have lost a significant amount of generation capacity recently. Gas is less than ideal, but it’s a lot cleaner than coal. We pay through the nose for both electricity and gas, with some of the highest prices on earth. Our state government sold off the so-called ‘poles and wires’ telling us that prices wouldn’t increase – what rot! Any private operator expects to make a profit, and the more the better. We pay for it, industry and small businesses suffer much higher operating expenses, and we all end up paying for that, too. No-one even dares to mention the ‘N’ word – nuclear. We have a significant amount of the world’s uranium in Oz, but to suggest it seems to be considered political suicide. Doesn’t make much sense when we have such a large amount of non-arable land for potential storage, and it’s unlikely that an agreement couldn’t be reached with the Indigenous People of central Australia. There’s a lot of land that is pretty much unusable by anyone, but there was a fierce outcry when it was proposed to use some of it for nuclear waste storage some years ago. We have to do something, and it needs to be done before more existing power stations reach their end-of-life. The Australian Federal Government (via the PM, Julia Gillard) has announced a ‘plan’ to cut power prices. I have no idea who they have been listening to, but it involves so-called “smart” meters. Yes, these meters are definitely smart, they will optimise the profits of the power companies at the expense of the householder. Off-peak tariffs are certainly cheaper than the ‘shoulder’ and peak rates, but during the day the people who can least afford to pay the peak price will be doing just that. Retirees and pensioners, the unemployed and those who work from home will pay the maximum possible price for their electricity. Also, pity help someone who comes home from work to a stinking hot or freezing cold home and turns on the air-conditioner. Since the daily peak rate seems to apply up to 9PM, it will be an expensive homecoming. Very expensive indeed. I don’t think that I’ve heard a single person claim that their power bills were reduced once a smart meter was fitted. Quite the opposite seems to be the case, and almost everyone who has been hit with a ‘mega-bill’ appears to have a smart meter fitted. I’d like to think that this “plan” is simply the result of stupidity and poor advice from those who should know better. If not, it means that vested interests have invaded the political system (what a surprise that would be), and are providing ‘advice’ that is completely at odds with the intention. Corruption anyone? Meanwhile, no-one in power seems to be bothered that the energy company top executives are being paid an obscene amount of money, while gouging energy users and crying “poor me” the whole time. Doesn’t anyone in government (state or federal) have the guts to stand up to these corporate leeches and declare that enough is too much? I have to voice my strong opposition to the half-arsed term “poles and wires” used to describe the electricity supply infrastructure. The supply network is a great deal more than “poles and wires”, and includes major and minor substations as well as the generators and other substantial equipment. Politicians have been complaining lately about the suppliers “gold-plating their poles and wires”, implying that unnecessary work is being done. Most of the suppliers have allowed their equipment to run down over a period of many years, meanwhile paying handsome dividends to state governments. Now that they appear to realise that they actually have to maintain their equipment (shock, horror), the public is expected to foot the bill. Governments have not done a single thing of any value to help keep prices down. IPART (Independent Pricing And Regulatory Tribunal) is about as independent as my backside! All anyone needs to do is make an application (plus apply a bit of pressure in the right places I guess) and their application is almost always granted in full, regardless of its merits or otherwise – every price hike by power companies has been approved. One place where there really is “gold plating” is granting licenses for wind power. A less efficient an more useless form of power generation is hard to imagine. You only get power when the wind blows, regardless of whether anyone actually needs power at the time. When power is needed and there’s no wind, these stupidly expensive white elephants sit on their hills looking ugly and doing nothing useful. Whether one believes in “global warming/ climate change” or not is immaterial. The simple fact is that what we are doing now is not sustainable. Reliance on fossil fuels simply means that our (great) grand-children will look back at our wanton depletion of these resources with pure contempt. No-one in government is game to point out the bleeding obvious – the way we generate power is wasteful, and creates immense pollution (including “carbon”). Hint … its carbon dioxide, not carbon. One is an element, the other is a combination of carbon and oxygen molecules, and the two are not equivalent! Do a web search on LFTR (pronounced ‘lifter’) – Liquid Fluoride Thorium Reactor. There are some seriously qualified scientists who realise that this is the future, but only one government seems to be taking it seriously enough to commit any funds to further research – India! Most people think 3-Mile Island, Chernobyl or Fukushima at the mere mention of neuclear, but that’s a totally different technology that received vast grants and support from the military because these reactors make stuff that goes BANG! In contrast, a LFTR reactor can be ‘fed’ the nasty stuff which it eats, it’s 100% fail-safe without the need to run cooling pumps for weeks after shutdown, and anyone stupid enough to try to remove anything nasty will simply remove themselves from the gene pool because it’s really difficult and dangerous. The reactive elements are comparatively ‘safe’ – but there are trace amounts of ‘nasty’ stuff. ‘Safe’ is a relative term I know, but is a coal-fired power station ‘safe’? If it’s burning brown coal (as mainly used in Victoria) safe – no. Black coal – well, maybe, a bit. No, it’s not really ‘safe’ either. Nothing that burns fossil fuel is really safe, and as described above it not sustainable either. It’s been estimated that Australia and the US have enough Thorium to last for thousands of years – it’s not very reactive, has a very long half-life, but is not a hazard in itself. We’ve been using it for years – gas mantels, cathode coatings in fluorescent tubes, vacuum tubes, old style CRT TV sets, but have never looked at the true potential. Nuclear (preferably LFTR) is absolutely the best choice. Base-load power (the most valuable kind), the ability to be made small (community power generation is possible), high efficiency, fail-safe (if done properly) – what more can we ask of a power generation system? Meanwhile, governments pay massive subsidies to wind farms, and guess who ultimately pays for this – it’s not the power companies! It has been claimed many times (look it up, don’t just believe or disbelieve) that without the subsidies no wind farm would ever turn a profit. Their bloody towers would rust and fall down before they pay for themselves. Look at the vast amount of steel and concrete used to build each one. These are both major contributors to CO2 production (in the order of 1Tonne of CO2 per tonne of Portland cement – the ‘active ingredient’ of concrete). We won’t examine environmental effects on nearby residents due to infrasound (and yes, it is real, it exists, and has the affects described by so many people who live near turbines. Governments and wind farm operators have relied on ‘tame’ acoustic consultants who are happy to tell them the story they first thought of, and never let the truth get in the way of a nice fat consulting fee. Graft, corruption, lies to the public and straight-faced denial seem to be good tools for the unscrupulous, and I have personal experience of the complete drivel that one can expect from any acoustic ‘consultant’ who has discarded ethics in favour of a bloated wallet. Me – cynical? I’d be a bloody fool to be anything other than cynical! ESP now includes a blog – Anything new will be announced here. I’ve been publishing electronics (primarily audio) information since 1999. There is something new on the ESP site though. Many people are experiencing ‘brown-outs’, where the mains voltage falls well below normal. This problem is worse now than it used to be, because most power companies are running their networks close to the limits, and they also use ‘renewable’ energy sources whose output can suddenly stop without warning. If your refrigerator (for example) tries to run while the voltage is low, the motor may be unable to start. This can lead to a burnt out motor in extreme circumstances, but Project 138 may well save the day. 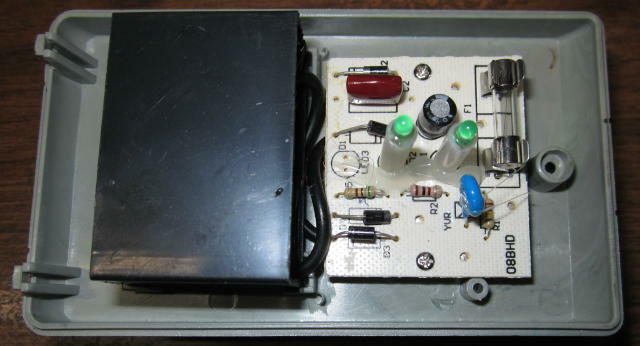 Valve (tube) amplifiers are also vulnerable, and surprisingly, some transistor amps can get very upset too – especially if the mains voltage goes higher than normal. I must warn anyone interested in building the circuit that it involves some serious mains wiring (in operation, the entire circuit is live), and should never be built by anyone not experienced or qualified to work with mains power. There’s another new project as well (well, it’s been on the site for about a month now). Anyone wanting to build a portable powered PA system should look at Project 137. It can also be used for powering Leslie (rotating) speakers commonly used with organs, or can be the basis of a pretty awesome party Hi-Fi system. System power is 250W, and it’s not only very loud, but clean too!